Tulips are showy flowers that are classified as perennial bulbs, but they can be somewhat tricky to grow in warmer climates. Not impossible, but growing tulips in warm climates is a challenge for sure. 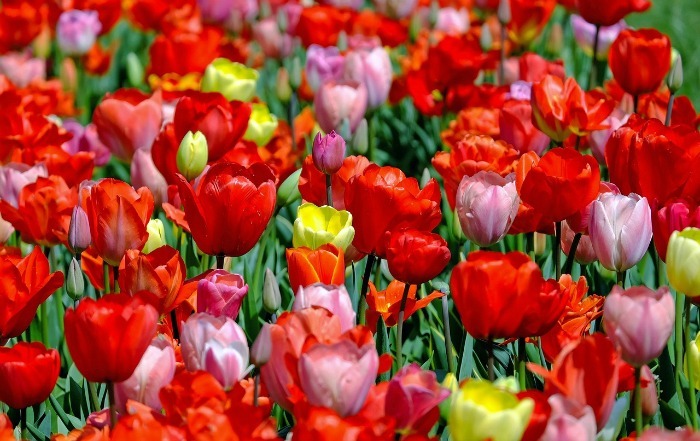 Tips for Growing Tulips when the Temperatures are Warm. Tulips are considered a true bulb. Not all flowering bulbs are actually a bulb. See my article on flower bulbs to help tell the difference between bulbs, corms, rhizomes and tubers. No perennial quite ushers in the spring months in such a dramatic way as a bed of tulips, so it is worth going the extra mile to have them growing. Most tulips like to have at least 12-14 weeks of a “cold period” to develop their beautiful flowers. Normally, nature will give this cold period by having the temperatures down and stay below 55 degrees for an extended period. In warm climates where the soil temperature doesn’t drop for long enough below 55 degrees, you may need to “fool the bulb” into thinking they’ve gone through a this cold period. Store your tulip bulbs in your kitchen refrigerator. Give them 6 to 16 weeks in a ventilated paper bag. Do not store them next to fruit, especially apples, all ripening fruit is giving off ethylene gas what will kill/damage the flower inside the bulb. Instead of fun sun, try planting them in a part of the garden that has some partial or full shade. You can also keep the soil temperature down by regular watering so that the soil is evenly moist. Let the foliage yellow for about 6 weeks before removing it. This gives it nourishment for next years flowers. Stop watering the bulbs after all the leaves are gone and let the ground dry out. The plant is no longer adding nourishment to the bulbs at this time, and the tulips need a dry period during the summer months. For more gardening tips, please visit my Facebook Gardening page. Have you had luck growing tulips in a warm climate? Please leave your comments below. Meg wanted tulips in TN quite about a decade ago. This was when she was in her dark purple/black phase. She was about 12 Or 13 I think. She picked out black and purple bulbs and stuck them in the ground with no instruction as I had no clue to give her. We had an enjoyable Sping watching them bloom. I went back to visit her last year and was shocked to see them in full bloom. I guess it gets cool enough there for them? Variety? Or maybe it’s just my Meg. Like you, everything and everyone blooms around her. what a sweet comment. Thanks Angie! i live in a warm climate, current my tulip bulbs are receiving cold treats. what should i do next?? I don’t do anything special to my tulips other than protecting them from critters who might dig them up. They should come back next spring unless you have a very very warm climate. They do like to have it at least someone cool in the winter. They can take frozen ground easily. My mother lives in Maine and her tulips come back each year. hello.. I’m from Indonesia. as we know, Indonesia has tropical climate which only have 2 seasons (wet and dry) and I want to grow tulips, so how is it? Two years back, i have planted 12 bulbs of tulips but get only one red flower, I didn’t have any idea of planting and caring the tulips but i was happy to get one tulip flower now this year i have again planted 6 bulbs with little idea if handling them, now praying to get more flowers in this spring, by the way i am from Pakistan.